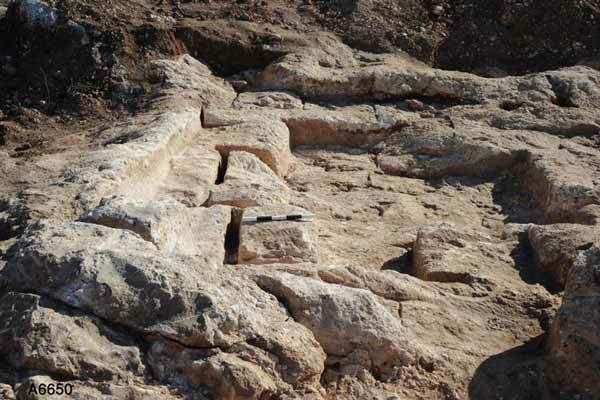 During November–December 2012, a salvage excavation was conducted at Ramat Bet Shemesh (Permit No. A-6650; map ref. 199238–390/623068–223), prior to construction. The excavation, undertaken on behalf of the Israel Antiquities Authority and underwritten by the Ministry of Construction and Housing, was directed by E. Kogan-Zehavi, with the assistance of N. Nehama (administration), A. Hajian and M. Kunin (surveying), A. Peretz (field photography), the Sky View Company (aerial photography), E. Belashov (drafting), I. Lidski-Reznikov (pottery drawing), L. Kupershmidt (metallurgical laboratory) and D.T. Ariel (numismatics). The site is located north of Nahal Yarmut and south of Horbat Bet Natif (Fig. 1). 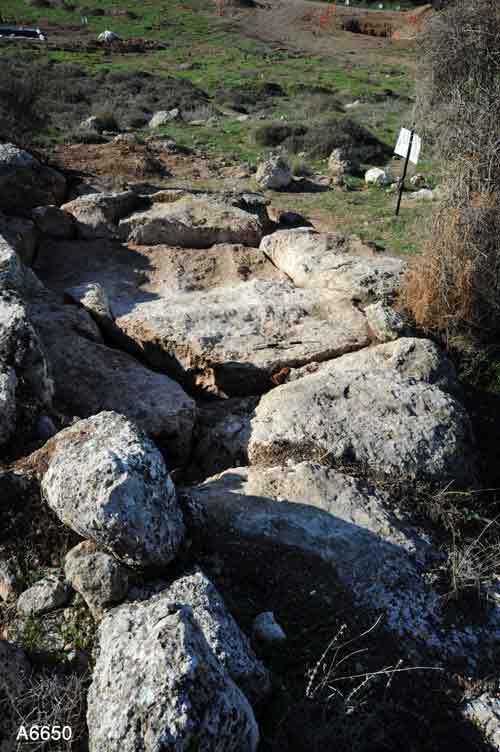 A former archaeological survey in the region documented a winepress, two cisterns, a ritual bath (miqwe) and two caves just east of the current excavation (Dagan 2010: No. 307.5; Dagan 2011:240–241). 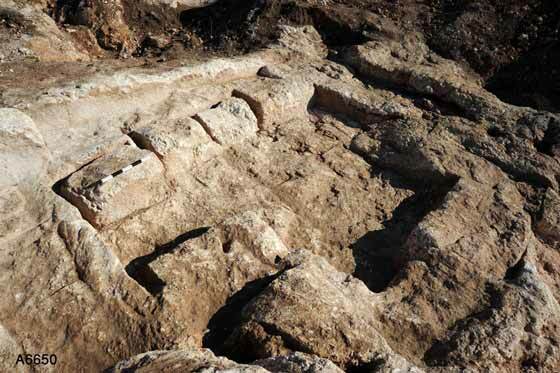 Various antiquities were exposed in archaeological excavations north of the excavation area, including agricultural walls, two caves that were not excavated (HA-ESI 125), a well, a cistern with a pool, and a section of an ancient road that led to Bet Natif (Permit Nos. A-6467, A-6485). 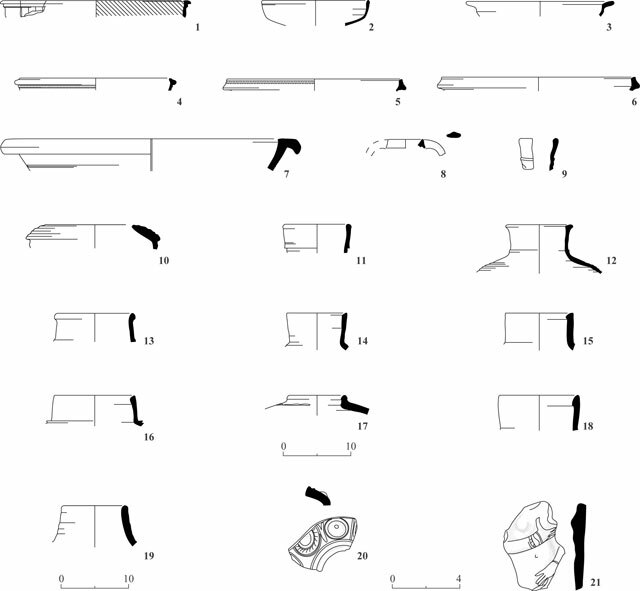 The excavation was conducted in two areas (A, B; c. 200×800 m; Fig. 2). 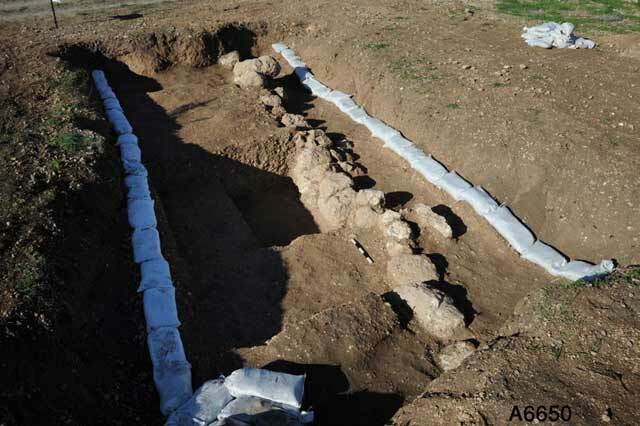 Area A (F4–F6, F8) was located in a wadi and agricultural walls, a wall that might have been used as a dam and a well were exposed. Area B (F11–F13, F100–F103) was located on a hill north of Horbat Bet Natif, where quarries, a miqwe and an olive press were exposed; the quarries were on the high part of the hillside. Agricultural Fences. A section of a wall (W3; min. length 10 m; width 0.8 m, preserved height 0.5 m; Figs. 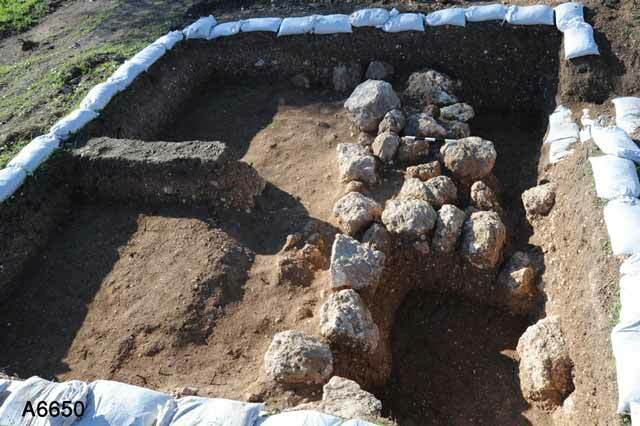 3, 4) was exposed at Site F4, in the northern part of the area. It was built of indigenous, roughly dressed fieldstones and qirton in dry construction that were preserved two courses high. The wall, found covered with alluvium c. 0.5 m below the surface (L106), was built across the wadi, in an east–west alignment, on brown clay and pebbles (L116) and was used as an agricultural wall. Trial trenches excavated on either side of the wall (L106, L114) revealed mixed potsherds from the Hellenistic, Roman and Byzantine periods (Fig. 5:1, 5, 7, 15, 17) in the soil fill that had accumulated on a level higher than the wall. Part of the body of a ceramic female figurine was discovered in the fill north of the wall (L114; Fig. 5:21; see excavation finds below). The level below the base of the wall contained scant finds, including body fragments and a rim of a jar from the Hasmonean period (Fig. 5:11). A section of a wall (W2; min. length 15 m, width 0.6 m, height c. 0.5 m; Figs. 6, 7) was exposed in Site F6 east of the wadi. It was built of indigenous, roughly dressed fieldstones and qirton in dry construction that were preserved two courses high. The wall was built in a north–south direction on brown clay and numerous pebbles and was used as an agricultural fence. Mixed potsherds from the Roman and Byzantine periods (Fig. 5:14, 16) were discovered in a trial trench excavated on the sides of the wall (L104, L120). Dam. A section of a wall (W1; min. length 6 m, width 1.4 m, height 0.91 m; Figs. 8, 9) was exposed in Site F5, in the middle of Area A. It was built of two rows of boulders and roughly dressed indigenous qirton indry construction. The wall, which crossed the wadi from east to west and was preserved two courses high, was discovered in the wake of a probe, cut by a backhoe to a depth c. 2 m below the surface. The wall, set on light brown clay and several pebbles (L111), was massive and therefore probably served as a dam. The meager finds included body fragments of Gaza-ware vessels ascribed to the Ottoman period and found in alluvium that had accumulated above the top level of the wall after it was no longer in use. Mixed potsherds from the Roman and Byzantine periods (Fig. 5:3, 6) were discovered in a trial trench excavated next to the wall (L105) and potsherds from the Iron Age and Hellenistic period were revealed in a probe beneath the wall (Fig. 5:10). Well. Site F8 was located south of the agricultural fences and north of Horbat Bet Natif; it is cited in Dagan’s survey (Dagan 2010: 292, No. 307.1; 254: No. 316.2). A well (inner diam. 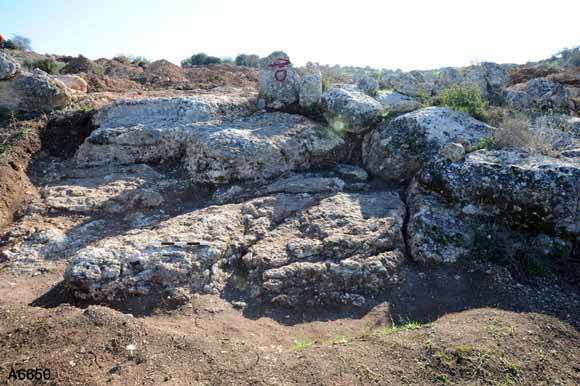 2.3 m), whose bottom was blocked with modern refuse, was visible on the surface of the site (Figs. 10, 11). The interior of the well was built of well-dressed rectangular stones (average size 0.2×0.4 m). 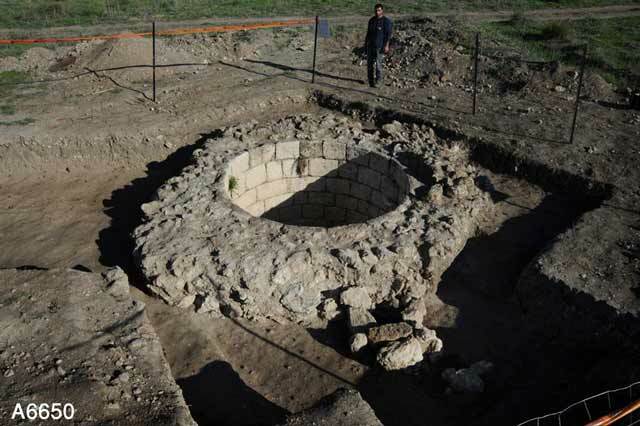 Two construction phases were discerned in the excavation of the well. A channel of roughly hewn indigenous qirton and covered with stone slabs was built on the southern side of the well (L127; length 1 m, width 0.4 m, inner depth 0.3 m, height including the covering stones 0.6 m) in the early phase; the channel became wider in the north toward the well and its southern side faced an open area. It was probably used to convey the discharge of excess water from the well to the fields. The well was raised by rebuilding its upper part in the later phase; the channel ceased to be used, as attested to by the canceled connection of the channel to the well in the north. In addition, small fieldstones (L115) that formed a square surface (presumed area 4×4 m), were placed around the opening of the rebuilt well. Among the finds on Stone Surface 115 were Gaza-type potsherds, a jar rim from the Mamluk period (Fig. 5:19) and two coins: one minted between the years 383 and 395 CE (IAA 141920) and the other is Ottoman. A fragment of a jug from the Ottoman period (Fig. 5:9) was discovered below the stone surface. Quarries. 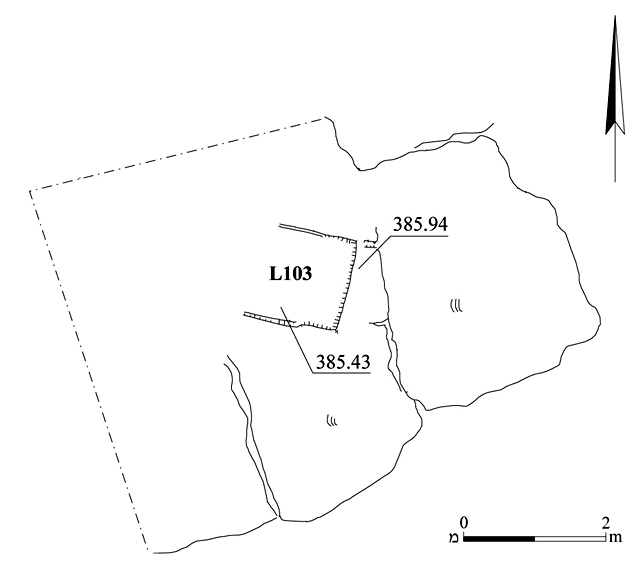 Three small quarries (F11–F13) were discovered on the rocky western slopes of the hill. Quarry F11 produced two steps in the bedrock (L101; Figs. 12, 13). 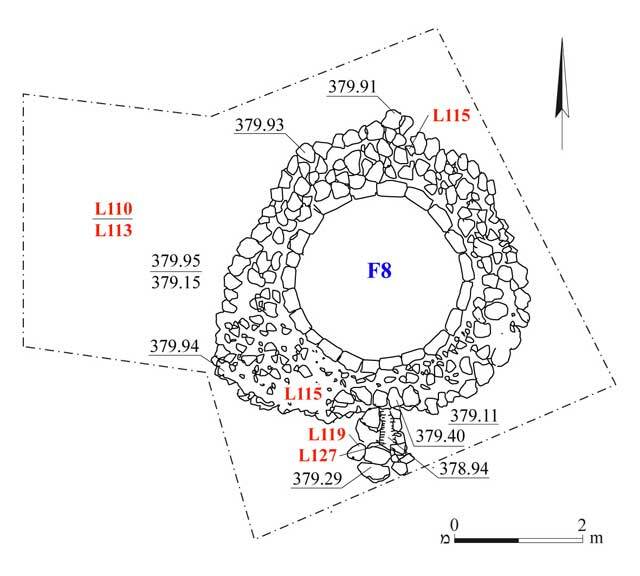 Quarry F12 produced a hewn surface with a separating channel (L102; Figs. 12, 14). 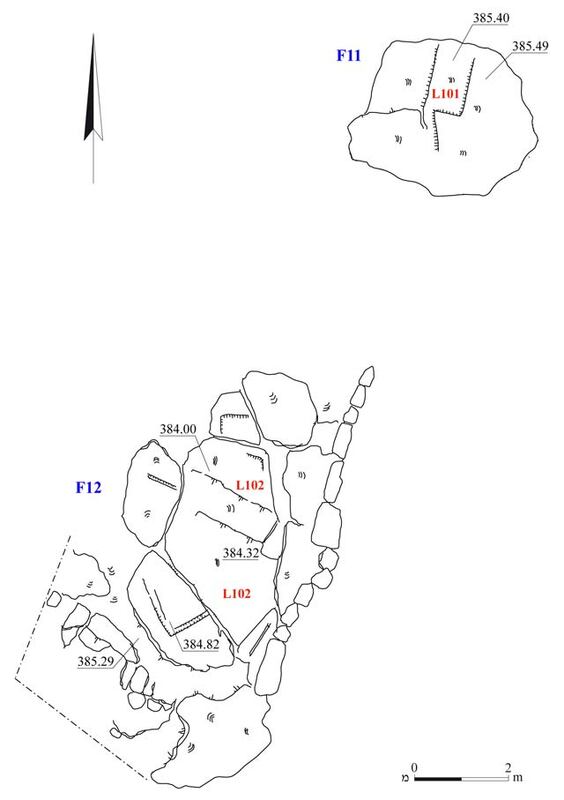 Quarry F13 was U-shaped (L103; Figs. 15, 16). It was not possible to date the quarries. East of these quarries were other quarries (F100 and F103) that overlooked Horbat Bet Natif to the west (Figs. 17–21). The quarries, located on the southern slopes of the hill, extended to the southwest across an area of c. 140 sq m (L122, L123, L125, L126, L129; Figs. 17, 19). They were stepped and had rectangular courtyards (depth 0.4–0.6 m) inside them. Signs of stone dressing were discerned in the quarries, as well as separating channels that were chiseled to quarry stones in a soft layer of limestone. 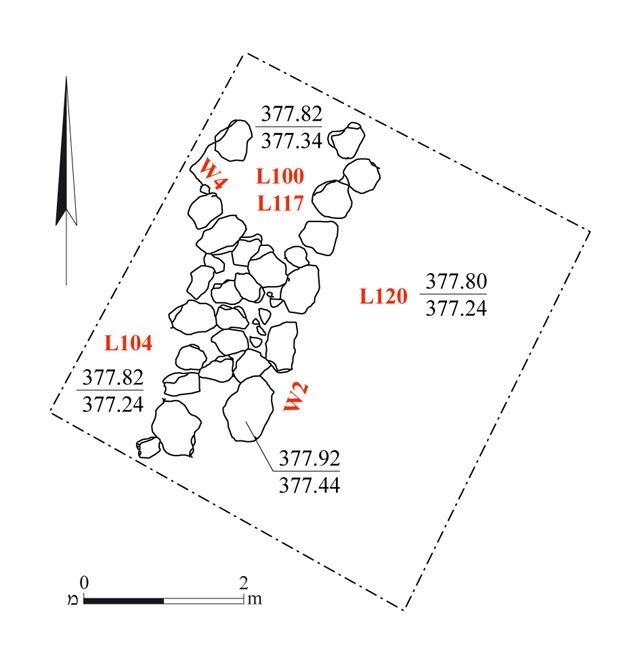 Stones that had not been detached were identified in Quarry F103 and their rectangular shape (L126; Figs. 19, 20) pointed to the production of building stones. A section of a quarry was noted to the south, where a round stone was hewn and may have been intended for use as a crushing stone in an olive press that was discovered nearby (L131; Fig. 19). Mixed potsherds were discovered in the fill that covered the quarry, among them a jar rim from the Early Roman period (Fig. 5:13) and a jar rim from the Byzantine period (Fig. 5:18). Coins were found in the fill that covered the quarries (L123, L128), among them a coin of Alexander Jannaeus (IAA 141921), a coin that was minted between the years 395 and 408 CE (IAA 141924), a coin from the fifth century CE (IAA 141923) and an unminted cast flan that dates from the second half of the fifth century CE to the first half of the sixth century CE (IAA 141922). In addition to these, two coins were discovered on the surface west of the quarries—one dating to the reign Tiberius and was minted in Jerusalem (17/18–24/25 CE; IAA 141925) and the other is a Roman provincial coin (second–third centuries CE; IAA 141926). 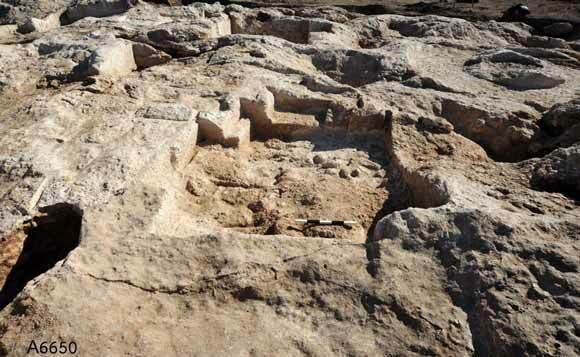 The quarrying activity was preceded by two installations—a ritual bath (miqwe; F101, L121; Fig. 17) and part of a crushing installation of an olive press (F102, L124; Fig. 19). The Miqwe, exposed at the eastern end of the quarry, was rectangular and rock-hewn. Its sides were straight (preserved height 1.8 m; Sites 22, 23) and it was coated with two layers of gray hydraulic plaster devoid of inclusions (L121; 2.20×2.95 m). Next to the northern side of the bath were the remains of a wall foundation, built of fieldstones in a foundation trench aligned east-west (Fig. 22). The entrance to the facility was set in the south and three different size steps descended to the immersion basin. From the opening, the descent was to a narrow step and a wide step following it, and then to the right, the descent was to two narrow steps (height 0.37 m) that branched off, one to the east and the other to the west. The steps were relatively high and might have been used as benches inside the immersion basin (Fig. 17: Section 2–2). A square rock-hewn pillar in the center of the immersion basin and opposite the opening (Fig. 23) served as a railing and a separation wall before the bottom steps that split prior the descent into the immersion basin. This division made it possible to enter on one side for immersion and exit from another side. The rims of a bowl and a jar from the Early Roman period (Fig. 5:2, 12) and a fragment of a lamp from the Late Roman period (Fig. 5:20) were discovered in the fill inside the miqwe. 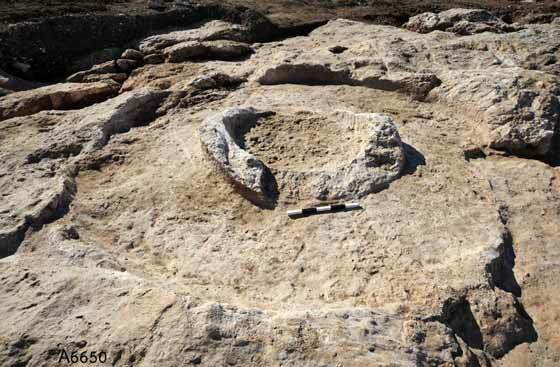 The Olive Press survived only partially and consisted of a crushing installation with a round rock-hewn base (L124; diam. 1.65 m, max. height 0.25 m; Figs. 17: Section 1–1, 24), which was meant to accept a crushing basin (yam). 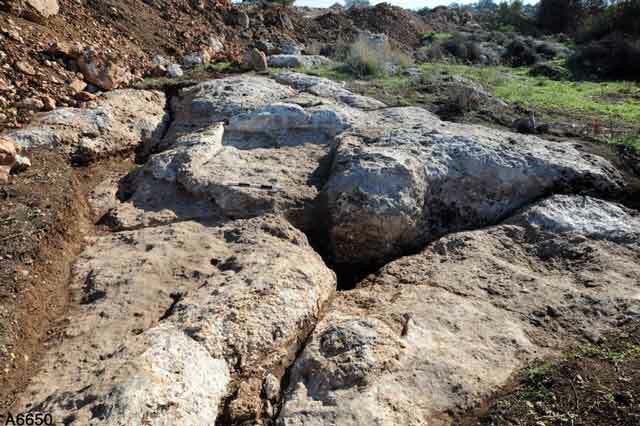 The surrounding bedrock was leveled so as to allow an animal to pass (width 1.1 m), walking in circles around the crushing basin and operating the crushing stone (memmel) that cracked the olives. 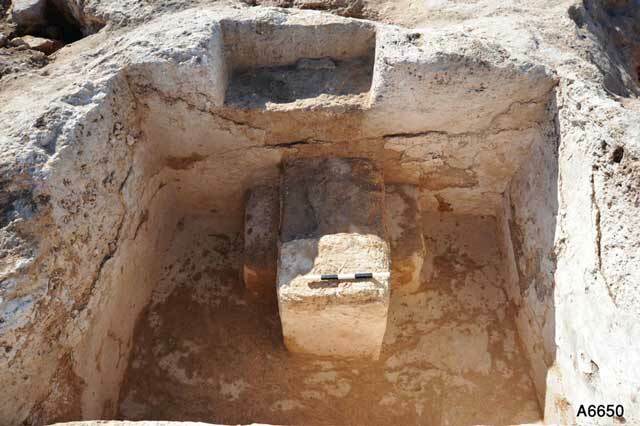 The yam and the memmel did not survive, nor did the rest of the olive press installations that were destroyed as a result of the quarrying activity. No datable finds were discovered. Potsherds discovered in Areas A and B dated to the Iron Age, and the Hellenistic, Roman, Byzantine, Mamluk and Ottoman periods. Those from the Iron Age included a hole-mouth rim ascribed to the seventh century BCE (Fig. 5:10). A Megarian bowl with a red-orange slip and a worn mold-made decoration (Fig. 5:1) is dated to the Hellenistic period and a jar with a folded and everted rim and a tall neck is ascribed to the Hasmonean period (Fig. 5:11). Pottery vessels dating to the Early Roman period included a bowl with a ledge rim (Fig. 5:3), a small bowl with a curved body and a thickened and everted rim (Fig. 5:2) and a jug that has an elongated triangular rim (Fig. 5:8). In addition, three types of jars are dated from the second half of the first century BCE to the first century CE, among them a jar with a thickened and everted rim and a long neck with a ridge at its end (Fig. 5:12), a jar that has an everted rim and a long neck (Fig. 5:13) and jars that have rims beveled inward and long necks (Fig. 5:14–16). The pottery from the end of the Roman period included a red-slipped bowl characterized by a rouletted decoration on the side, dating from the third to the early fifth centuries CE (Fig. 5:4), and a fragment of a fill hole of a Bet Natif lamp that dates from the second half of the third until the fourth centuries CE (Fig. 5:20). The Byzantine period pottery included two rims of red-slipped LRC bowls (Fig. 5:5, 6). The bowl in Fig. 5:5 is similar to Hayes’ Form 3C and dates to the years 460–490 CE and the bowl in Fig. 5:6 resembles Hayes’ Form 10 and dates to the late sixth–early seventh centuries CE (Hayes 1972:337, 345–346). Other finds included a krater with a ledge rim that is folded downward and a decoration of a wavy design on the side (Fig. 5:7), a Gaza jar (Fig. 5:17) and a jar characterized by a thickened rim on the inside (Fig. 5:18). The pottery from the Mamluk period included a jar rim (Fig. 5:19) and a rim of a Gaza-type jug of gray clay (Fig. 5:9) is ascribed to the Ottoman period. A fragment of naked female figurine (Fig. 5:21) is a special find discovered at Site F4. The figurine is made of light brown, slightly pinkish clay (width 3. 5 cm, thickness 0.7 cm, height 5.5 cm). The front of the figurine is mold-made and its back is smooth. Only the upper part of the body was preserved, without the head. A rounded chest, a flat stomach with a naval in its center, and two arms wearing bracelets have survived. The female’s right hand is turned up and placed on the bottom of the stomach and her left hand is supporting the right breast. The archaeological context of the figurine is unclear because it was found in a mixed ceramic assemblage that contained potsherds from the Hellenistic, Roman and Byzantine periods. A variety of clay lamps and figurines that dated to the third–early fourth centuries CE were found in two refuse pits in excavations at Bet Natif in 1934 (Baramki 1936). The artifacts in the assemblage included mold-made fertility figurines fashioned in an eastern style that is typified by a schematic display of the anatomic details and stylized decorations, such as bracelets on the arms. Some of the fertility figurines are standing in a position similar to that of the figurine from our excavation and the appearance of bracelets on the arms is also similar. Consequently, the figurine can be ascribed to this group. The figurine was found in an agricultural area north of Bet Natif and was likely brought there from one of the houses at Bet Natif. 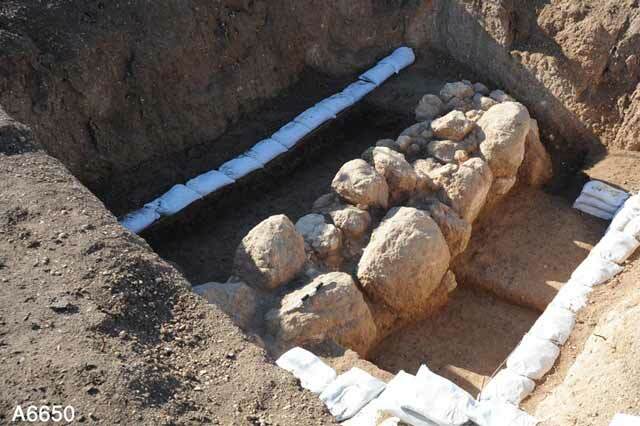 The finds from the excavations are remains of agricultural activity that occurred in the region during the Hellenistic, Roman, Byzantine, Mamluk and Ottoman periods. Agricultural areas extended across Area A, which served as the agricultural hinterland of the settlement at Bet Natif. The numerous fences along the wadi are indicative of cultivation plots in the region. The ceramic finds show that the fences postdated the Byzantine period and that the construction of the dam was later than the Roman period. The well located in the south of the wadi is known as Be’er Natif and it also appears on the PEF map (Conder and Kitchener 1880). Based on the finds discovered in its vicinity, the well was used in the Mamluk and Ottoman periods, up until the present; it is not known when it was built. No architectural remains were found around the well and it seems that water was drawn from it by hand or by means of a wooden hand wheel. 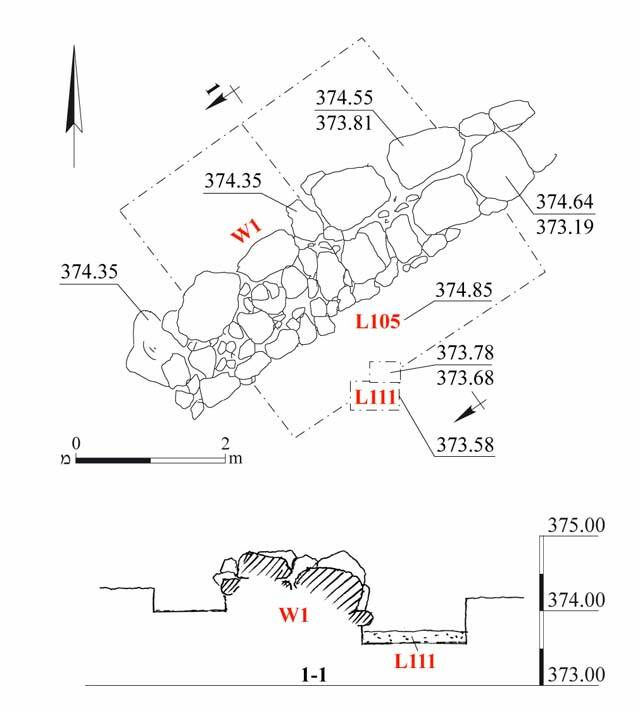 Area B was used for installations, among them an olive press, a miqwe and quarries where other installations were found nearby, such as winepresses, cisterns and caves (Dagan 2010:240–241). The area was utilized for hewing installations and quarries, both because of the soft limestone bedrock and because of the thin soil that was unsuitable for cultivation. On the basis of the limited excavations at Horbat Bet Natif, we know of a settlement there in the Late Roman and Byzantine periods (Baramki 1936). The installations can be attributed to the Bet Natif settlement and the olive press shows that an important economic branch in the region was based on growing olives and producing oil. 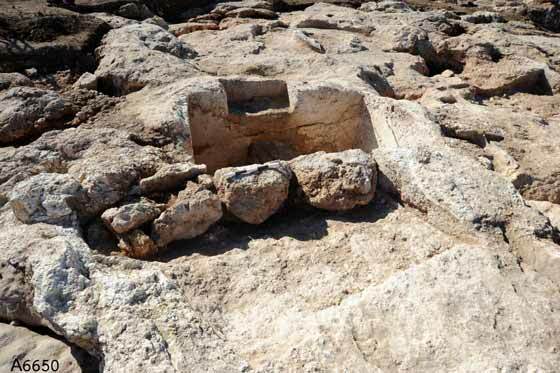 The miqwe adjacent to the olive press shows that the installation was operated by a Jewish population. The ceramic artifacts and coins discovered in the area of the miqwe and the quarries reinforce this assertion. 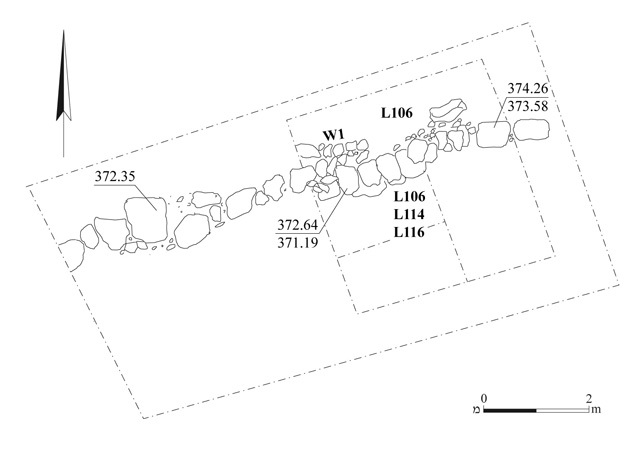 This data allows us to posit that the beginning of the settlement at Bet Natif was already in the Second Temple period; a similar picture is also arising from the tombs discovered in the region (Zissu and Klein 2011). The settlement at Bet Natif was re-established during the Late Roman period. To construct the buildings, quarries were established for supplying the raw material; the miqwe and the olive press were then negated. The period when the quarries were operated can be dated to the third–fifth centuries CE, as evidenced by the variety of coins discovered in their vicinity; this dating is consistent with the time of the rebuilding of Bet Natif. Baramki D.C. 1936. Two Roman Cistern at Beit Natif'. QDAP 5:3–10. Conder C.R. and Kitchener H.H. 1880. Map of Western Palestine in 26 sheets, from the Committee of the Palestine Exploration Fund. London. Dagan Y. 2010. The Ramat Bet Shemesh Regional Project: The Gazetter (IAA Report 46). Dagan Y. 2011. 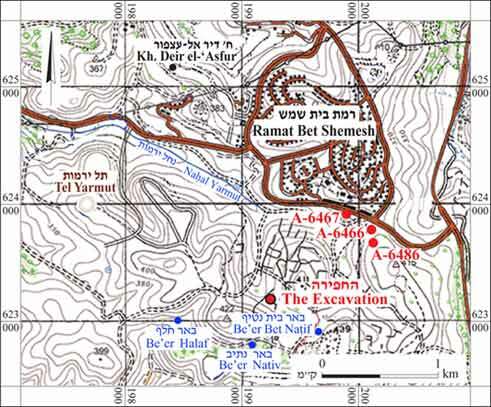 The Ramat Bet Shemesh Regional Project: Landscapes of Settlement: From the Paleolithic to the Ottoman Periods (IAA Report 47). Hayes J.W.1972. Late Roman Pottery. London. 3. F4, Agricultural Fence 3, plan. 4. F4, Agricultural Fence 3, looking northwest. 6. 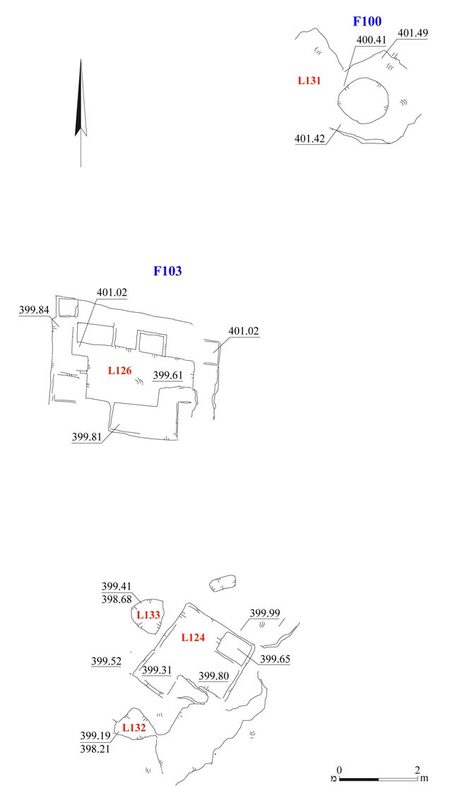 F6, Agricultural Fence 2, plan. 7. F6, Agricultural Fence 2, looking south. 8. F5, wall/dam, plan and section. 9. F5, wall/dam, looking south. 10. F8, well and channel covered with stone slabs, plan. 11. F8, well and channel covered with stone slabs, looking north. 12. F11 and F12, quarries, plan. 13. F11, quarry, looking south. 14. F12, quarry, looking north. 16. F13, quarry, looking west. 17. 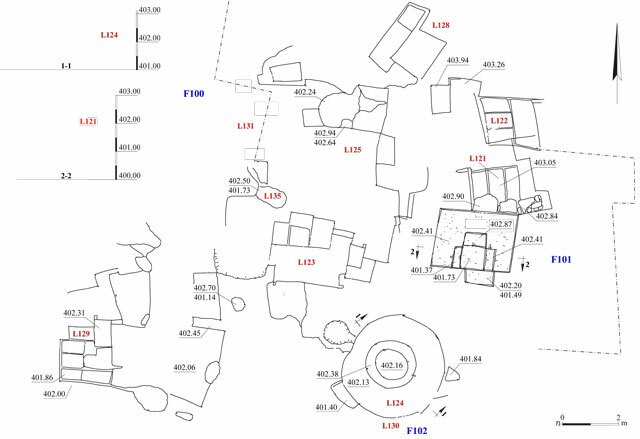 Area B, plan and sections. 18. F100, quarry, looking west. 20. F103, a quarry courtyard with stones not completely detached, looking northwest. 24. F102, round base for a crushing basin of an olive press, looking north.